Ms. Marlinda Haudley, a 2013 program participant at the University of California Los Angeles. She graduated from Arizona State University in May 2017 with a Bachelor of Science degree in Nutrition (Human) and a minor in Integrative Health. 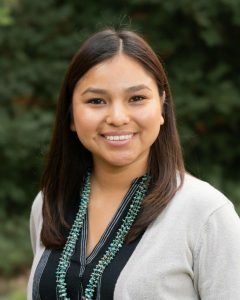 She is currently working at Altru Health System in North Dakota while attending North Dakota State University’s Master of Public Health program with a specialization in American Indian Public Health, with later plans to attend dental school. What lead to your interest in a health profession? I was born and raised on a Navajo Reservation. When I left the reservation for college my viewpoints of myself and the world I lived in changed. As a Native American, I recognized the need for better healthcare on the reservation, so I decided to begin my journey into dentistry as a pre-dental student. There are many health disparities on the reservation that make living a healthy lifestyle a challenge, so I want to be a part of the improvement of healthcare through proper oral health and nutrition for my community. This realization from a Western prospective opened my eyes to a bigger picture of how I could give back and improve the lives of my people. Who or what inspired you? I was truly inspired to pursue a career in dentistry when I participated in SMDEP in 2013. After meeting Dr. Tamana Begay, a Navajo dentist and a member of the SHPEP National Alumni Advisory Board. She was the first Navajo dentist I ever met. She helped me build confidence and demonstrated how I could be impactful in my community. By simply having the opportunity of meeting someone who was from the same reservation, recognized the same disparities and knew my challenges of trying to figure out how to be successful many miles from home was the boost of inspiration I needed. What obstacles did you overcome in your educational journey? When I left the reservation for college, I experienced culture shock, and I struggled to succeed. I was accustomed to life on the reservation so I had to quickly make a few lifestyle changes. Throughout my undergraduate education, I worked two to three jobs while going to school full-time in effort to afford my living expenses. Raised in a low-income, single-parent home, I promised myself that I would not give up and leave the city without a college degree. Leaving the reservation for college made me resilient in all aspects of my life. This includes mentally, educationally, spiritually, and emotionally. I experienced almost everything a non-Native student would experience, but the biggest challenge I had to overcome was adjusting to a new environment, learning style, and being separated from home and everything I knew. Are you an alumni? We want to hear from you!